This website provides access to the air temperature data measured by the UC Cooperative Extension in vineyard regions throughout Santa Barbara County. The links to the annual data sets by year are listed below; each file contains the hourly average readings, in Excel format, for all stations in the county during that year. Data is collected from all stations after the end of the year and then posted online. 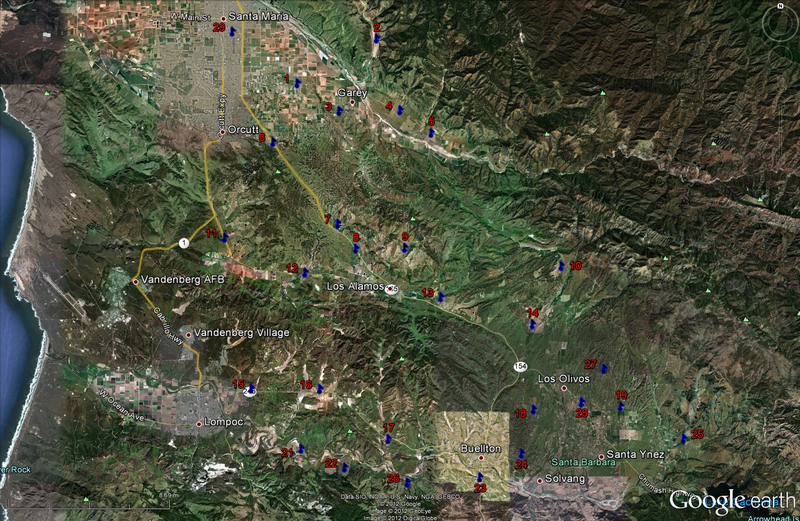 The locations of the individual stations are indicated with the blue dots and corresponding numbers on the aerial photograph below; the same numbers are used for the data file names. For example, file 2009-SB-5 corresponds to the 2009 year values for station location 5 on the map. Each year's Excel file has individual worksheets that contain the data for each site. Note that the Excel file that is downloaded to your computer will have a different file name than is listed here (e.g. 45138), but when you open the Excel file you will see the correct identifier with the data. Similar temperature data for San Luis Obispo County is available here. There is no data for site 16 for 2009. Site 28 is new for 2009, near Los Olivos. Site 29 was installed in late 2009. There is missing data for site 20 for 2008. Site 17 is missing some October data.